Both stocks fell in 2018, but which is the better buy right now? Looking for bargains in the bear market? Take a closer look at autos. Automakers' stocks have been under pressure for months, due to concerns about slumping earnings as new-car sales moderate in key global markets. Often, when an industry falls out of favor, there are a few value-priced gems waiting for patient investors. 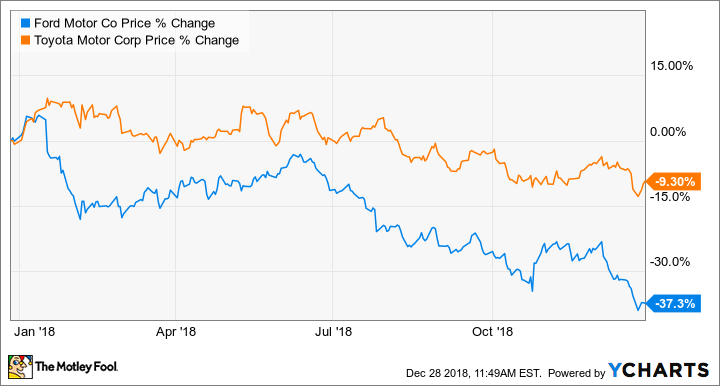 Below, I put two of the bigger names in autos head-to-head: Giant Toyota Motor (NYSE:TM), the industry's champion of consistency, versus longtime investor favorite Ford Motor (NYSE:F). Which is the better buy for new money now? Read on to find out. The Ranger pickup is one of several new Ford products expected to boost margins over the next couple of years. Image source: Ford Motor. The last 12 months have been rough for nearly all automakers' stocks, and Ford and Toyota are no exception. But while Toyota's stock has weathered a decline of roughly 11%, Ford's has been hit much harder: It has fallen nearly 40% in the past year. F data by YCharts. The charts shows the percentage change in each stock's closing price over the year ended Dec. 27, 2018. When we look at valuation measures based on earnings, both companies are trading below the historical norm for auto stocks in good economic times (around 10 times earnings). At the moment, Toyota is trading at about 7.1 times its trailing-12-month earnings, while Ford is trading at just over five times its earnings over the same period. Looking ahead, Wall Street analysts polled by Thomson Reuters expect earnings at both companies to decline next year, which makes both stocks look a bit more expensive. The analysts currently expect Ford to earn $1.33 per share in 2019, on average, for a forward price-to-earnings ratio of 5.9. They expect Toyota to earn 836.47 yen per share in the fiscal year that will end on March 31, 2020, giving us a forward price-to-earnings ratio of about 7.7. Ford pays a quarterly dividend, currently $0.15 per share. In the last three years, it has also paid a special "supplemental" dividend early in the year. Over the last four quarters, Ford has paid total dividends of $0.73, for a dividend yield of 9.3% at current prices. That sounds exceptionally high, but take note: Ford paid supplemental dividends in strongly profitable years. Investors should not assume that Ford will pay a supplemental dividend on an ongoing basis. The company has said repeatedly that it plans to maintain its regular dividend of $0.60 per year "through the cycle," meaning through a recession, and it has cash set aside to ensure that it can. That regular dividend gives a still-impressive yield of 7.7%. Toyota pays dividends twice a year. In the fiscal year that ended on March 31, 2018, Toyota paid total dividends of 220 yen per share. That was up from 210 yen per share in the two fiscal years prior, and translates to a dividend yield of about 3.4%. The takeaway: At current prices, Ford's dividend yield is the clear winner. Toyota CEO Akio Toyoda has pushed for more exciting products while reducing costs -- incremental changes that have helped Toyota keep pace with rivals. Image source: Toyota Motor. Both Ford and Toyota have plans to increase profitability over the next several years. Toyota's is incremental: Like several of its rivals, including Volkswagen AG and General Motors, it's in the process of moving most of its vehicles to a shared architecture, called TNGA (for "Toyota New Generation Architecture"). The idea is that basing lots of different models on TNGA will reduce costs by improving economies of scale and streamlining manufacturing, while increasing the speed with which Toyota can launch new models and variants. Ford CEO Jim Hackett is committed to improving the company's "fitness," by which he means not only profitability, but also the speed with which it can respond to market changes or launch new models. Hackett, who took the top job in May 2017, has noted that while Ford's revenue increased substantially over the last several years, so have its costs -- limiting its profit gains. His plan, currently unfolding in different stages around the world, involves reworking Ford's product portfolio to maximize profitability and simplify manufacturing, while also revamping Ford's internal processes to make the company more nimble. Like Toyota, Ford is also planning to move to shared architectures, though its effort is a few years behind its Japanese rival's. With respect to risk, neither company is likely to collapse entirely. Both are major employers in their home countries, and both would likely benefit from government support if something like a protracted recession were to put them in danger. From a near-term investing perspective, the biggest risk to keep in mind is that these are cyclical companies, and their sales and profits will decline when the economy declines. At least theoretically, both Ford and Toyota are also at risk of disruption from new technologies -- autonomous vehicles, electric drivetrains -- and new models of personal mobility. But note that both companies are investing aggressively to keep pace with potentially disruptive rivals, and they're likely to hold their own as the auto industry evolves. Toyota is the conservative play: Strong credit rating, huge cash reserve, steady global demand, efficient manufacturing, decent dividend yield. It's unlikely to drop too far in a bear market -- but it's also unlikely to soar in a recovery. While Ford is hardly unhealthy, it's arguably a bit of a turnaround situation right now. The company has been hit by rising commodity costs, a big slump in its sales in China, and pricing pressures in Europe. Ford's veteran management team is working to address all of those situations (and more) with solutions that for the most part appear sensible and likely to be effective. But note that patience will be required. While chances are very good that Ford will be able to pull off substantial improvements in its profit and margins, it may be a few years before all of Hackett's efforts bear fruit. Ford's stock may languish in the meantime -- but for those reinvesting the company's strong dividend, that might not be a bad thing. Long story short: Investors who can afford to wait a few years could do a lot worse than to buy Ford at current prices and reinvest the dividend while the company restructures (and while the economy works through whatever lies ahead). You might be very pleased with the results a few years from now, when Ford's "fitness" has improved and the economy is in an upswing.